Today is the 35th anniversary of one of the most significant and thrilling battles in boxing history. On this date in 1981, a pair of boxers universally regarded as among the very best in the sport clashed for undisputed supremacy over the welterweight division. It was the kind of match-up fight fans dream of: two great talents; both in their primes; high stakes and high drama. The anticipation and the build-up was immense, culminating in the richest prizefight in history up to that point. And amazingly, “The Showdown” more than lived up to the hype. 35 years ago it was the biggest fight in the world. The bout also stands as one of the key chapters in a tale boxing fans have come to call the era of “The Four Kings,” when a quartet of remarkable and gifted pugilists all competed at the same time and gave boxing some of its most unforgettable clashes. 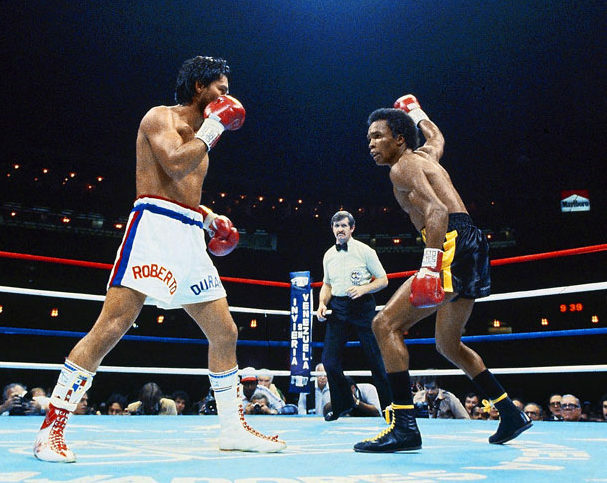 Sugar Ray Leonard, Marvelous Marvin Hagler, Thomas “Hit Man” Hearns and the man they call “Manos de Piedra,” Roberto Duran, all just happened to share the main stage at the festival of fisticuffs that was the decade of the 80s. While Larry Holmes, Julio Cesar Chavez, Mike Tyson and others also gave the decade some massive attractions and unforgettable nights, the series that truly defined that time was the one involving four men who can all claim to have been both major box-office attractions and among the very best, pound-for-pound, at their dangerous profession. First there was The Brawl in Montreal. 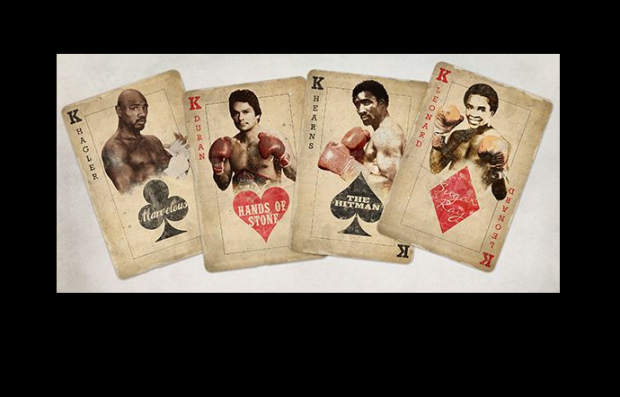 If Marvin Hagler’s rise in the late 70’s and Leonard vs Duran I are the first chapters in the saga of The Four Kings, Hearns vs Leonard I is the part of the tale where the plot thickens, the cast of characters is complete, and the reader knows the story they’re about to enjoy is one that will keep them up long into the night. 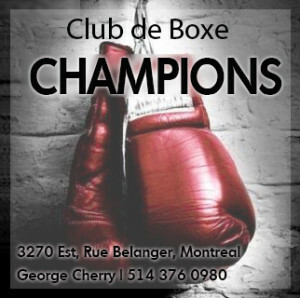 It was a dramatic struggle that enhanced the standing of both men, that confirmed not that one boxer was clearly better and another inferior, but that each were something special, the kind of talents that, if we’re very lucky, come along a few times in a decade, boxers who could compete at the elite level in any era. And, as mentioned, it was the biggest, richest fight in boxing history up to that point, and this in itself was a revelation as such milestones in terms of gate receipts and massive audiences customarily belonged only to the heavyweight division, those larger-than-life events involving legends like Jack Dempsey, Joe Louis, and Muhammad Ali. 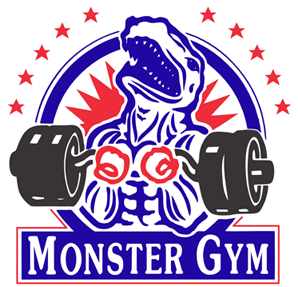 But bringing new energy and attention to the sport in the early 80s were not the big men, but instead the smaller fighters, specifically the welterweights. From 1979 to 1982, it was the most talent-packed weight class in the game, with so many elite level fighters crammed into its confines there was no way all the potentially great matches the division had to offer could ever be made. 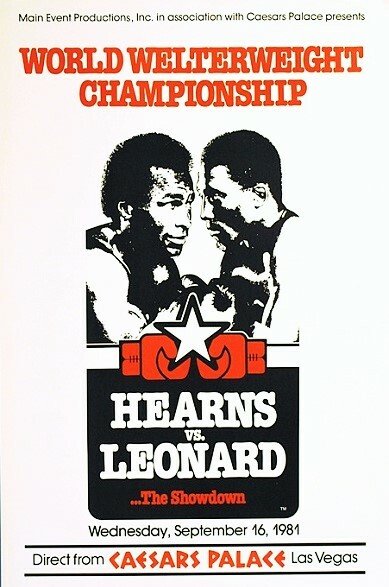 Which is part of why Hearns vs Leonard I was such a must-see event for sports fans. Everyone knew the 147 pound class was the hottest division in boxing and that Tommy and Sugar Ray were the best of the best. 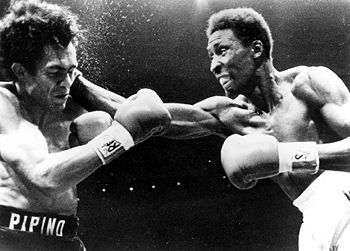 Leonard was coming off big wins over Wilfred Benitez, Duran and Ayub Kalule, while Hearns had demolished former champion Angel Espada and feared knockout artist Pipino Cuevas in explosive fashion. 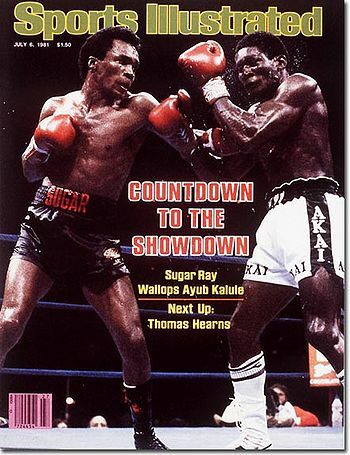 It was the classic confrontation: the skilled boxer in Sugar Ray vs the awesome power puncher in “Hit Man” Hearns. It was the fight the world couldn’t wait to see. Then Sugar Ray defeated Duran in New Orleans. But the same could be said for the first clash between Leonard and Duran, or between Hagler and Hearns, and Sugar Ray vs Marvelous Marvin. It was the era of “The Four Kings,” and some call this time “the last Golden Age of boxing,” an exaggerated and hyperbolic view, but what is inarguable is that boxing needed these four fighters to come along when they did. With the larger-than-life figure of Muhammad Ali having exited the stage, the heavyweight division failed to inspire big attention and impressive ticket sales. Between 1980 and 1989 what did was the fistic brilliance of four pugilists who together staged nine major events, some of the biggest fights in history, and combined for a spectacular record of 229-15-4. Leonard’s win over Kalule further set the stage. As in the past when great fighters collided on the big stage, these four Hall of Famers brought out the best in each other. Hagler was never more impressive than when he conquered Hearns. 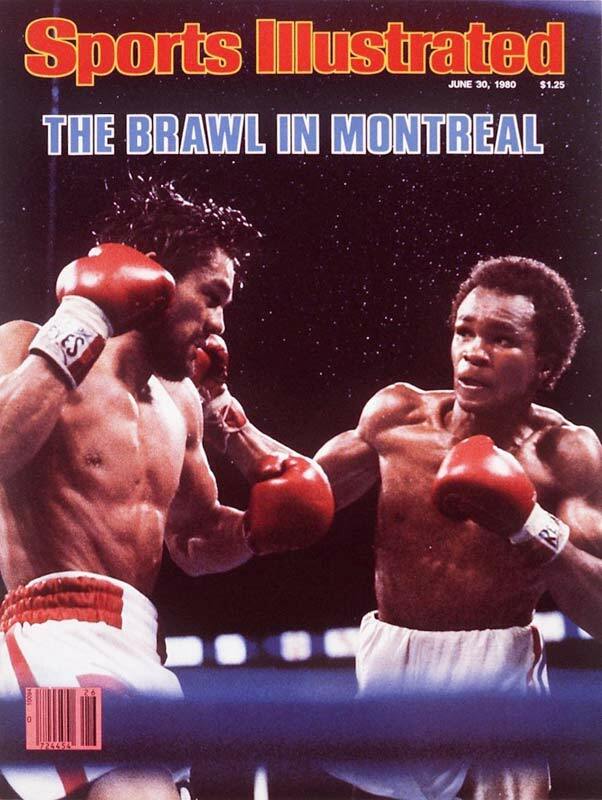 The finest performance of Duran’s career is of course his great victory over Leonard in Montreal. “The Hit Man” never looked more lethal than when he blitzed “Hands of Stone ” in just over four minutes. And Leonard’s comeback win over Hagler in 1987 ranks as one of the most stunning in pugilistic history. 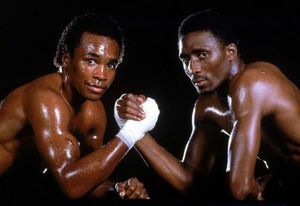 But the first battle between Sugar Ray Leonard and Thomas Hearns occupies a special place, largely because it answered crucial questions and demanded tactical adaptations no one expected. Could Leonard, who had been shaken by Duran’s power, withstand the massive cannon that was Tommy’s right hand? Did Hearns have answers for Ray’s boxing skill and astonishing speed? The answers were both in the affirmative which meant the two warriors had to dig extra deep to ask even tougher questions and push their adversary to the limit. Both men rose to the challenge and the result was a thrilling, back-and-forth struggle that by the time it ended left millions of fight fans almost as worn out as the fighters, such was the drama and suspense. 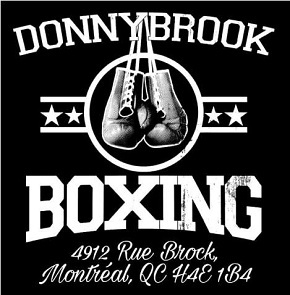 As everyone knows, The Fight City is a place where we live to indulge in boxing history, where the past is as vivid and alive, if not more so, than the present. So no one has to ask us twice. The 35th anniversary of one of the greatest fights and most exciting nights in the long history of pugilism is the perfect excuse to immerse ourselves in the thrills of yesteryear, and thus starting today, we offer a week of posts focused on what will forever be a remarkable time in the sport’s history. There were 5…Wilfred Benitez gets-unjustifiably in my opinion-left out because a fight between him and Hagler never came, but he belongs there.